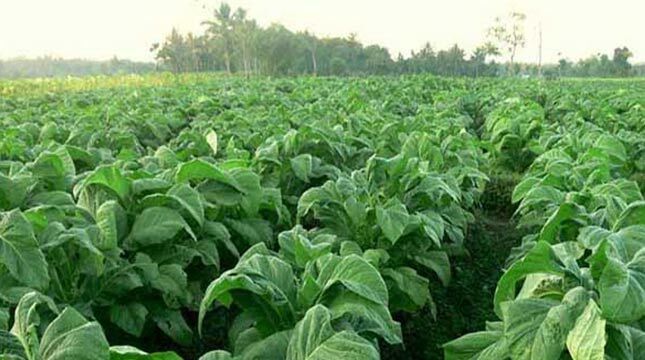 INDUSTRY.co.id - Bojonegoro - Agriculture Service of Bojonegoro Regency, East Java is optimistic that the need of tobacco industry as much as 10,600 tons can be fulfilled from the production of this year's planting season. "We are optimistic that the needs of a number of manufacturers is also a tobacco businessman with a number of 10,600 tonnes of dried tobacco either Virginia Voor Oogst (VO) and Java can be fulfilled from tobacco production this year," said Head of Plant Annuals Department of Agriculture Bojonegoro, Imam Wahyudi in Bojonegoro, East Java, Monday (07/10/2017). Imam said the assumption referring to factory data required the area of ​​this year's tobacco plant Virginia VO 7,750 hectares, and Java 83.33 hectares and 1,500 hectares of RAM. In addition, continued Imam, PT Sedana Arief Nusa Ngawi who partnered with farmers also grows Virginia tobacco RAM of 1,500 hectares. In the partnership program, farmers obtain tobacco seeds as well as production costs from PT Sedana Arief Nusa Ngawi which will purchase tobacco farmers. According to him, the development of Virginia RAM tobacco plants that become partnership program of PT Sedana Arif Nusa Ngawi grows from year to year. "The area of ​​the Virginia tobacco plant is not only in the western region, but now also penetrated the southern region, among others, in Sugihwaras and Kedungadem districts," said Imam. Currently, more Imam, certified tobacco seeds that have been distributed free to farmers through farmer groups number 28.12 kilograms with Virginia tobacco details VO type of T-45 as much as 27.710 kilograms, K -326 as much as 2,710 kilograms and 700 grams Grompol Java. "PT Gudang Garam also distributed seeds to farmers, but the extent we do not know for sure," said Imam. He admitted that he had instructed all field extension officers to do extensive data collection of tobacco plants that have been planted in this year's planting season. "This week we will record the entire area of ​​tobacco plants that have been planted," said Imam. Imam added that the voids of Virginia VO and Java that are already stabbed, among others in District Baureno, Kepohbaru, Sugihwaras, Ngasem, Temayang, which is located in the south and partly in Kanor. "The last ideal planting period is actually the end of June, but we still tolerate the July crops throughout the harvest without rain," said Imam.